this silver sugar tongs bears the mark of the city of Hamburg (Germany), around 1825/1830, silversmith David Peter Hermann Baumann (ref. E. Heirmann & B.Schliemann, Goldschmiede Hamburgs # 820: courtesy Charles C. Cage). 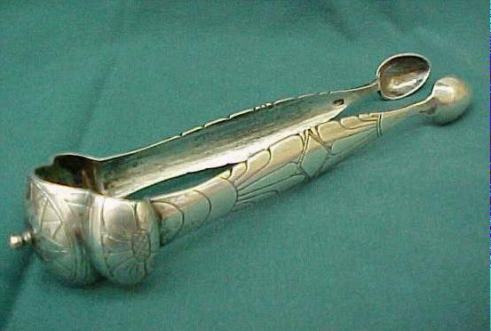 The top portion of the tongs is decorated with an engraved stylized flower, surmonted by a protruding stamen. This a typical example of Biedermaier taste, with engraved stylized petals centering a diamond with monograms EWL on one side and AR 1843 on the other. The tongs are 6 in. long (cm. 15) and were bought from an U.S. dealer through the Internet.